Hi all. 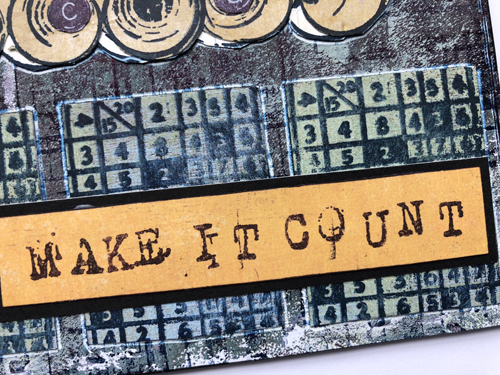 Seth Apter here once again, bringing you my two newest sets of stamps with PaperArtsy. Very excited about this release as the designs are very different for me. 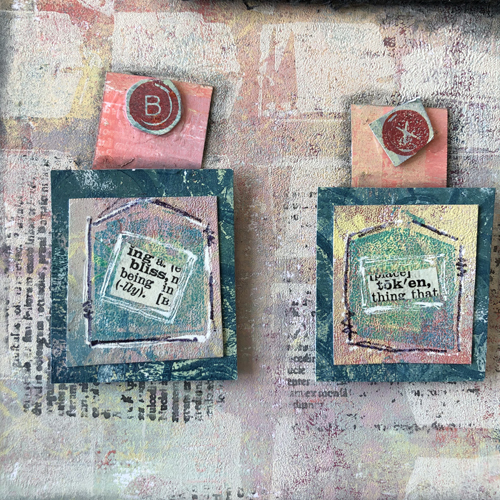 My previous PaperArtsy stamps sets have been designed around elements that were part of my mixed media artwork. For these new sets, I looked to my photography for inspiration. 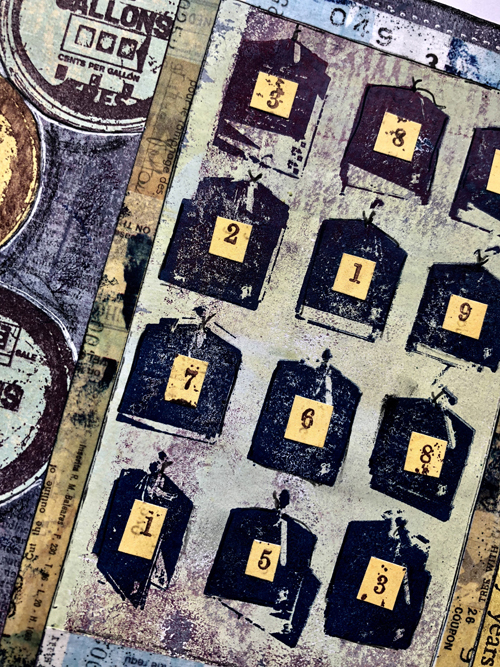 These stamps were created directly from photos I have taken on my travels and are my very first sets of object-based rather than abstract designs. So pack your bags and follow along as I introduce you to my newest collection. Leandra: Itit super exciting when a designer takes their stamp creativity into a new direction. Like a fork in the road, they follow their gut instinct, and allow themselves to grow and evolve. We are the direct beneficiaries of that change in their creative process. I've had the good luck to play with these already, and will share below, but what might you create? I really look forward to seeing what you will do with these stamps! 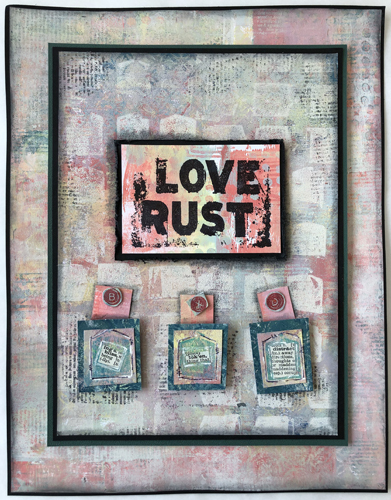 This piece was created using all four stamps from set 09, with each stamp being used in a different way. 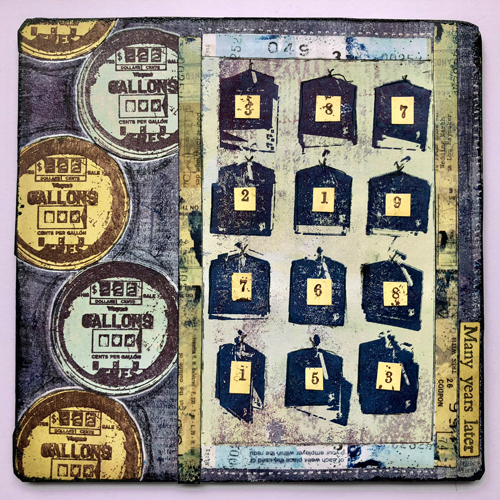 The rectangle stamp, based on a photo of drawers from an art flat file, was added to the background layers to add dimension, design and detail. The large focal image was created from a photograph of a stack of paint cans that I digitally altered. 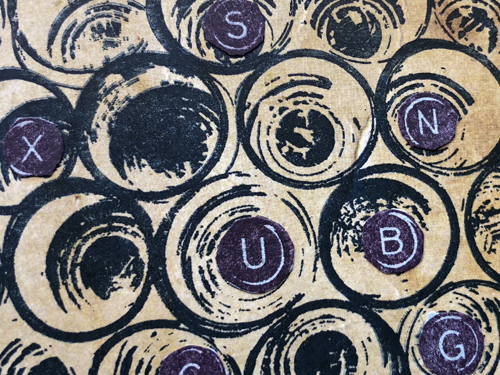 It was stamped on painted paper, cut out and adhered to the surface. The typewriter keyboard letters and numbers are all part of the same stamp but here were cut out after being stamped and then glued “inside” the paint cans. 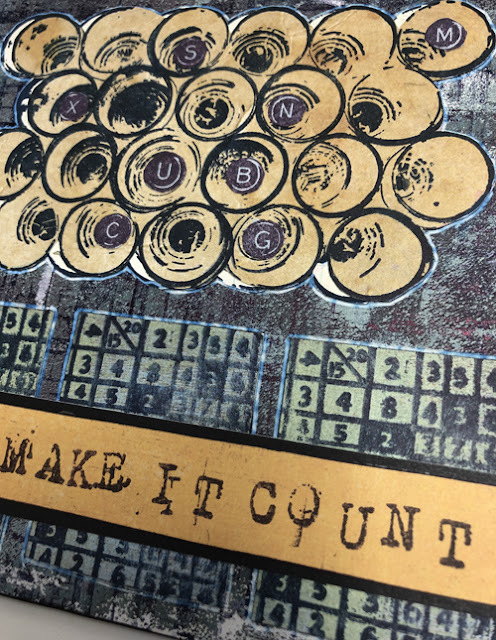 Finally the rectangle stamp with the grid and numbers came from a shot I took of a vintage game board and was stamped three times - a magical number in art. The second piece I made for this release uses 4 of the 5 stamps from Set 10. The painted background was enhanced by randomly adding the text stamp, photographed from a vintage Latin book. Detail was also added to the background using the tree branch stamp. 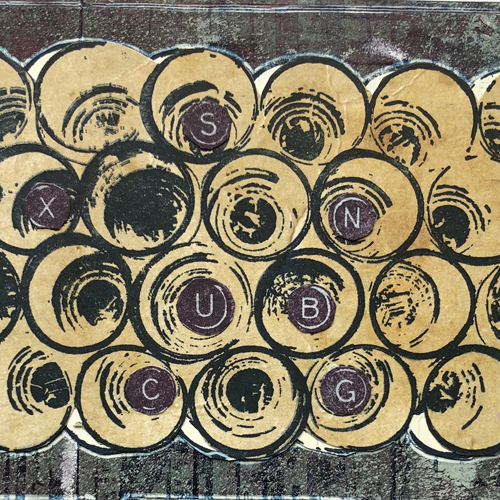 The main image was made using the stamp with a design abstracted from a photo I took of a wall of tags, each inscribed with a wish. Kind of looks like tea bags to me too! Finally, I used the stamp of a vintage gas pump sign to create the repeating patterns on the left side of the piece. 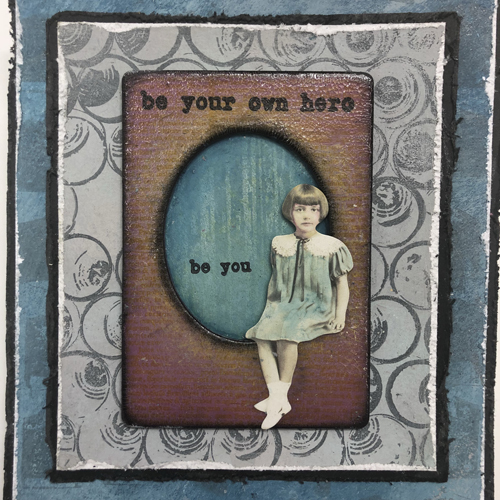 As we had a bunch of new Frescos to play with, my first port of call was to play with Seth's new stamps and some simple painterly layers. 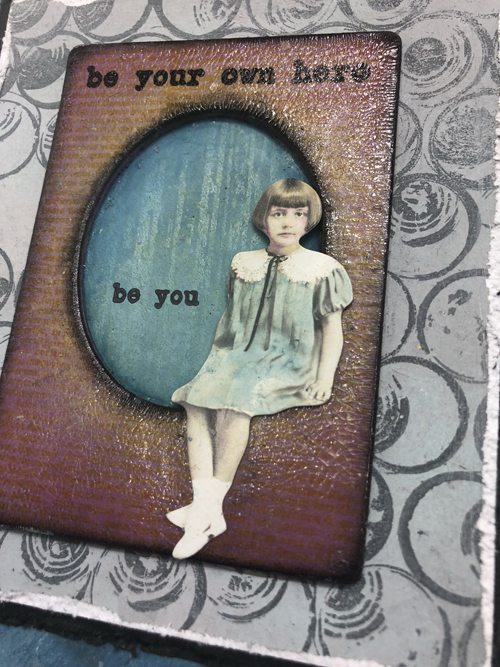 When I matched the frame and the Paper-Doll girl together, I painted and layered them both, finishing the frame with some rock candy crackle, but it was stamped with the fine text from ESA10 too, in a yellow ink. 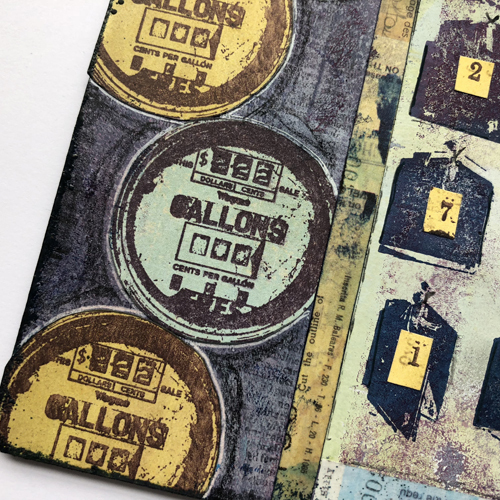 The paint can background was perfect when stamped with watering can ink over the new Koala and Eggshell painted layer. And in the large blue layer I also stamped the tags, but as I covered most of it up, it only adds a subtle texture and depth. 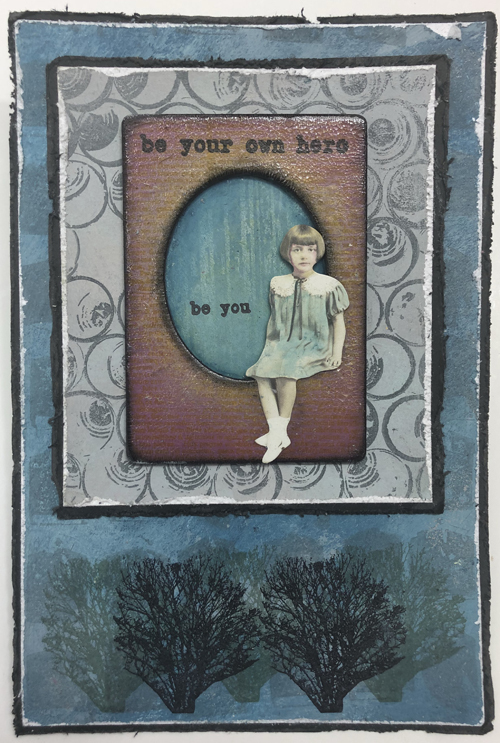 The words are from a new Sara Naumann stamp, I did wonder about putting them below the trees, but decided against. Project Two: Pretty Rust ! 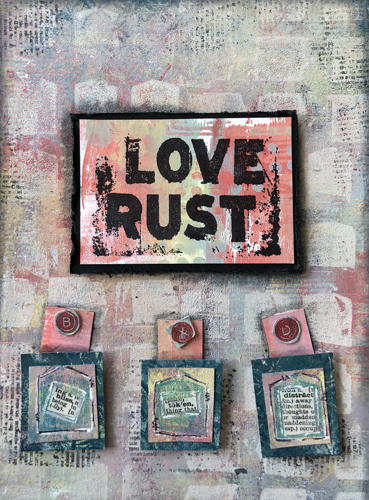 'Love Rust' was one of the stamps Seth didn't use in his samples so I thought I would base what I made around that image, however, the background I made kept getting brighter and prettier - not so Rusty! But I went with it anyway! I really love the end result as the colours are much softer than I would normally make, a change of colour palette in shades of a delicate summer! Maybe an English summer, but not the current one which is sooooo HOT! 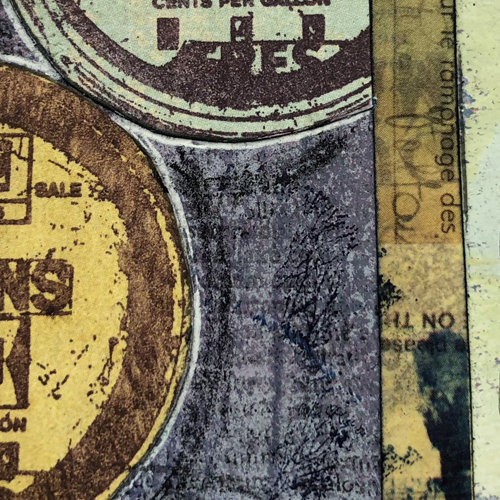 I started by making the background for the main piece, Gel printing was the main method, but then I had to stamp the 'tags' stamp from ESA10 in chalk white paint which I loved! Here's a close up, you can see the layers of the new Frescos: Sea Glass, Peach Nectar, Lemon Meringue really softens the Peach to a warm Apricot colour, but it is astonishing how bright the Peach is on its own as you can see on the Rust label. I also made a pale purple (shhh - no comments) with the Sea Glass and Blah-Mange - purely accidental of course, but I must say the soft Pastel tones are so soothing! 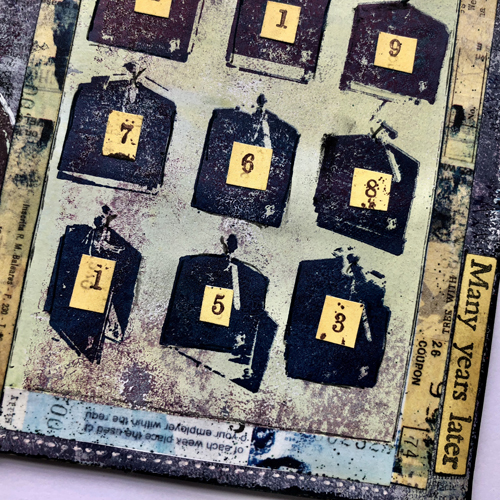 I created a few' bespoke' tags with Seth's tags too, layered onto dark card made with the new Twilight and Pine Grove Frescos. But I also really loved how the fine Script stamp (from ESA10) stamped up when inked with the grey ecoline watercolour marker. 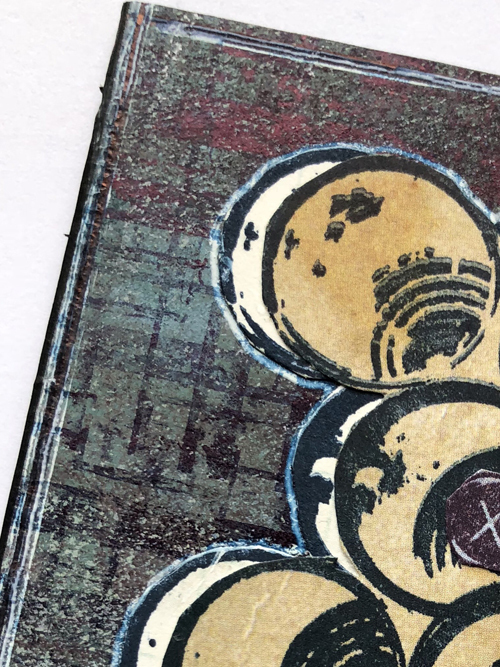 I also used that marker around the outer edges of both layers and repeated a bit more of the script stamping to the edges of both layers too. 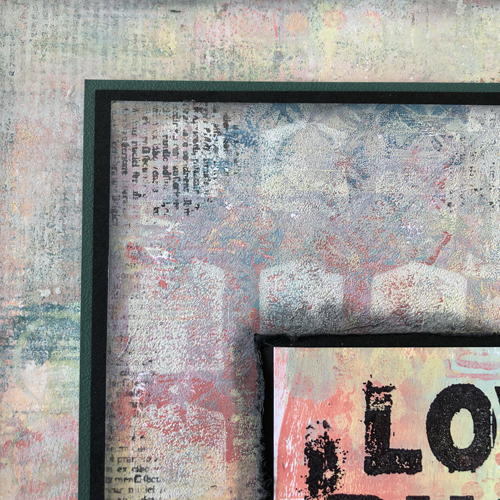 This close up really shows the many layers of paint I managed to create in the backgrounds of both layers. Oh well, maybe I've made Seth's stamps a bit more feminine than he might be used to, but I have seen him embracing pinks a lot this year, so i'm pretty sure he'll be on board with this effort! 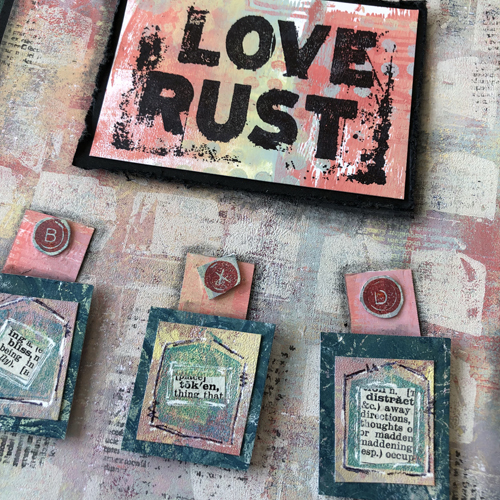 I've thoroughly enjoyed my play with these new stamps, and there are a lot of stamp elements in his new sets that will work so well as layer builders and feature images! 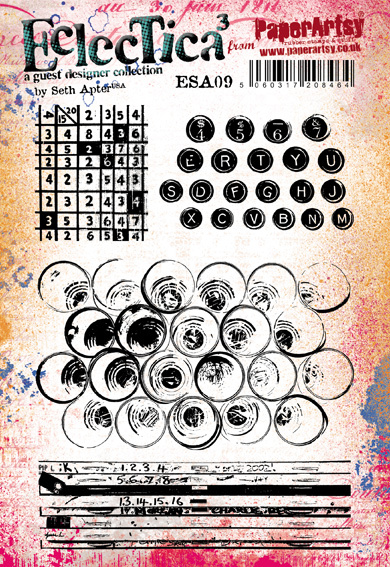 Seth Says: I am excited to see how you integrate these stamps into your artwork and journals. Feel free to send images of your work to me so that I can share them on my social media sites. As you may be aware, I am in Australia at the moment, and internet access as I travel and work cross the continent has been a bit patchy, but I look forward to seeing your comments and what you might create with my stamps as soon as I'm back online. In the meantime, Leandra has a couple of items to share with you too. Congratulations Seth on creating another 2 fantastic stamp sets!! Congratulations Seth - another 2 amazing sets to add to the collection! And I love, love, love the inspiration from Seth and Leandra - Leandra, it's great to see you creating! fabulous stamps again, Seth! will have fun with these. Loving the samples from both you and Leandra. Fantastic, I love the paint cans. I wonder if it is the photo I am thinking of, if so I was there lol fabulous to see how the photo evolved. Awesome samples, well done everyone. Interesting new stamps! Love the samples from Seth and Leandra! Congratulations Seth!! I wouldn't have imagined these were coming from cans of paint! 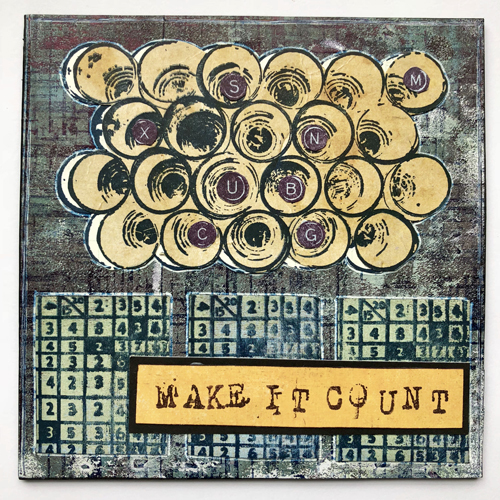 Great images to create lots of collage projects and more! Love the tags too. And I love the not so rust sample, Leandra! Embrace the pink, of course! Congrats to both! Absolutely scrumptious new stamps, Seth - going to the top of my list... I love them. And great samples too. Congratulations! 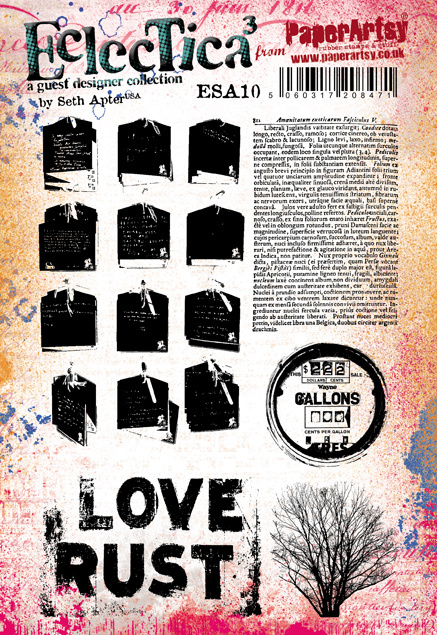 Seth on yet another fantastic new stamp release. Love the thinking behind the designs.